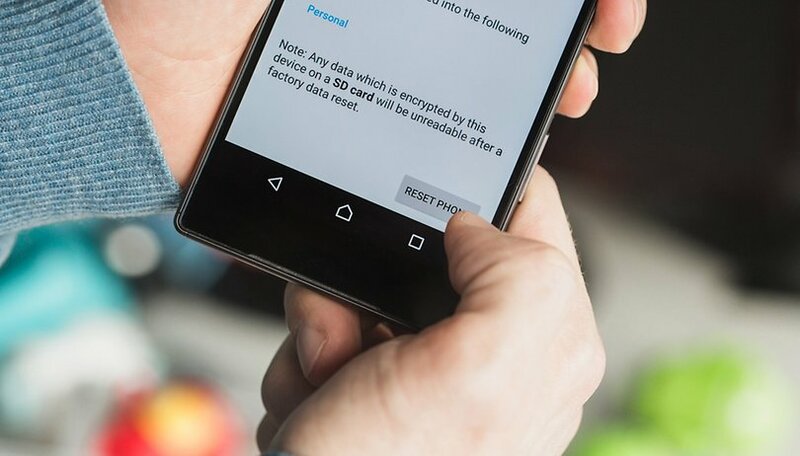 Encryption of your device before factory resetting will leave the data jumbled and unable to be retrieved. Quote from article "Unfortunately, even devices with built-in encryption are not safe from these weakness. The decryption key is also left intact on a device once it has been factory reset. While that key is itself encrypted, gaining access to it would be a few days’ worth of work for most hackers, according to the researchers." @Kris K: You should read the article again. This is interesting for tmobile users who take part in the jump program. All those phones that get traded in for new ones still have user data on them even after being "reset". I don't like that I had to read half the article for you to say the most recent phones may not be vulnerable to this and then there is no way to check. Scary, I thought a factory reset would do it all! Deleting data just means forgetting the "address" of the data in question, so the data themselves still exist on somewhere in the memory.... it's an old story of computer science. If that's the case, Android is not to blame for, same goes for Windows and iOS, AFAIK. For wiping entire data and making a clean break with old phones, some tech-people say that after factory-resetting the phone, we better leave the phone shooting a video with its camera until filling up rest of the storage, so as to overwrite entire memory with "stuffing" over your old data. Hmm? Thus might be a clue 2 a mystery I've been trying 2 solve ever since the Aug 1 security patch showed kernel in red & said software not recognized by AT&T. Plz turn off & bring 2 nearest att store. I was locked out. Bricked they (att) said. But I managed 2 get it back to working w/o losing anything. And the patch worked. BUT.. ever since my supposedly never used s5active now says "custom" at startup. Even tho every sign points 2 it having never been tampered with. Then I got fruit ninja & it said "welcome back hazel eyes" ? That's not me! This also happened when I 4got my FB pswd. I asked 2 use the phone number sign in option & it showed a number NOT belonging 2 me. Now I did get OTA marshmallow. W/o problems. But I was,sweating all the way thru! Also I now have auto security patch updates turned off 2 avoid being "bricked" 4 a 2ND time. Does ANYONE KNOW HOW I COULD DEFINITIVELY figure out what's causing my phone 2 say custom? I've tried a l I t of things. My knox isn't tripped. No root. I just need answers. Btw. DO NOT TRUST WE DEALS ON EBAY. They told me the phone was NEW.It did come in 99%perfect Condition. But this custom business us a mystery. Especially since I've updated 3 times OTA thru att. Any feedback will be greatly appreciated. I want the custom message/ghost software gone. P.s. I've done every type of reset I know of already also. THANKS!! So basically a factory reset isn't a factory reset, and sell your mobile at your own risk. A couple of years ago my LG Gingerbread phone stopped booting after being dropped., I was delighted to learn that it supported a "hard reset" - see hard-reset.com - supported by some but by no means all models. Above and beyond fixing the phone, the hard reset deleted almost all the bloatware that came preinstalled on it, substantially increasing the available internal storage. This is an OEM not Android functionality, and far better than "factory reset". my tablet is constantly telling me I am offline, presently connected via wi-fi. It is coming on but cannot access anything, i trie to reset , thats why I am having more numerous problems than before. What if you manually log out of all accounts and using the account providers website on PC BAN usage on the device thats gonna get sold? Dancing naked without a chicken head mask might be a problem. Wow... had no idea. I'm on the Verizon Edge program, so I have to (and already have twice) return the phone to Verizon when I upgrade. Sold previous phones on eBay, too, after factory resets. Me too have all my own phones dating back to my nokia 5110, stored in a cupboard. As Mak S. above said it's the same with pc harddrives and I have had the suspicion that it might be the same with mobile phones. Saw this on Yahoo also. That is the reason I still have every phone I've bought back to the Nokia N95 any banking info credit card and everything else you did is still there. Just the link to is gone, like on your computer hard drive. If the information isn't over written then it still there and can be recovered. If I have a hard dive fail it gets introduced to my 16Lbs sledge hammer before it's recycled. That is what going to happen to about 6 phones soon.